Lantronix, one of the worlds most trusted brands of serial Ethernet converters (serial device servers), providing high quality and super reliable products ideal for even the most critical applications. Their newest device server called xDirect is one of the most versatile and interesting products we have seen in a long time. Not only does the xDirect offer all the standard features of a good serial Etherent converter, it also has many advanced features, AES encryption, a small form factor and a fast 16-bit x86 processor just to mention a few features, and all this at a resonable price,... almost sounds too good to be true. 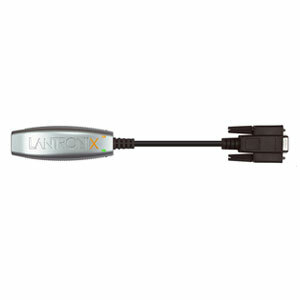 The Lantronix xDirect serial Ethernet converter has an inline form factor which makes it ideal for installation 'right on the wire', where it then can be powered either through the DB9 serial port or through a mini USB power supply. It is designed around Lantronix's own CPU (DSTNI-EX) which features easy to use management with the included Virtual COM port re-director software (DeviceInstaller™). However, the server settings can also be configured through a standard web-browser, over Telnet, Serial login or SNMP. Another feature of the xDirect is that it offers security in the form of 128/192/256-bit AES Encryption, which is a rare feature in this price class. Built into the included Com Port Redirector software, TruPort® technology enables Windows-based applications to access and control serial ports on the xDirect as if they were actually local PC serial ports. The application can monitor and set hardware pins on the xDirect serial ports as well as access serial buffers for total Com port control. This allows existing applications to seamlessly transition from controlling local devices to true remote monitoring and control of devices around the world. 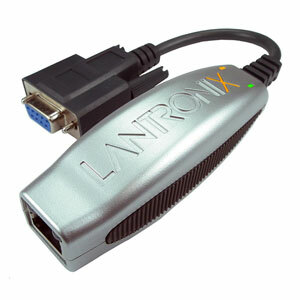 Please see our full line of Lantronix products for alternative solutions. Software Windows 8, Windows 7, Vista, XP, 2008 Server, 2003 Server (32-bit and 64-bit versions), DeviceInstaller™ configuration software, Com Port Redirector software and related utilities. Electrostatic (ESD) protection Serial Port: 15 kV ESD protection on RS232 and RS422/485 transceivers.